earthquake | Salt 'n Peppah! Yesterday, as I was taking advantage of the outstanding weather while enjoying my 3 mile brisk walk in the park, I was trying to think of a concept to write about later in the day using “taste.” I wanted to use metaphors that included and fused the power of the senses to bring about my love for the “flavor of tasting the day.” I know that might sound odd, but I truly enjoy food. Actually, I enjoy meals. I love the process of creating culinary atmospheres that are filled with conversation, laughter, good wine and backed with some amazing music. I felt the earth move. Literally, I could see and feel the condo vibrating and undulating under me. It lasted a brief ten seconds or so, but it was a very unusual sensation. As I looked at the cat for some sort of visual on her take of the experience, I saw no reaction from her as she continued to swat at a honey bee on the porch. I initially thought that perhaps my blood sugar was out of whack, or maybe I was experiencing an unusual heart palpitation. I was not crazy. This time. Needless to say, the activity and the buzz from this rare East Coast occurrence put a slight damper on my writing project for the day. So I compensated. I played chef. Below are photos of what I now fondly refer to as my “Quake Concoctions.” Enjoy. "Earth Topplers?" 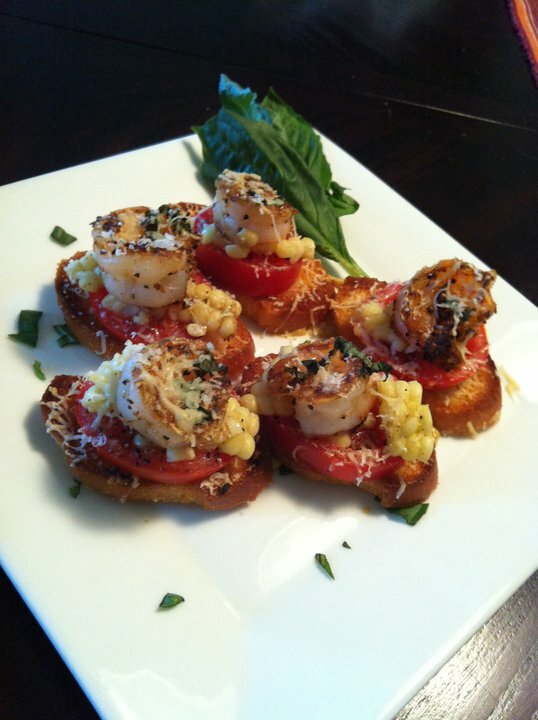 Home made olive oil and fresh garlic toastettes, topped with plum tomato, sweet corn from the cob, spicy shrimp, fresh chopped basil and shaved Parmesian. "Richter Scale Skewers?" 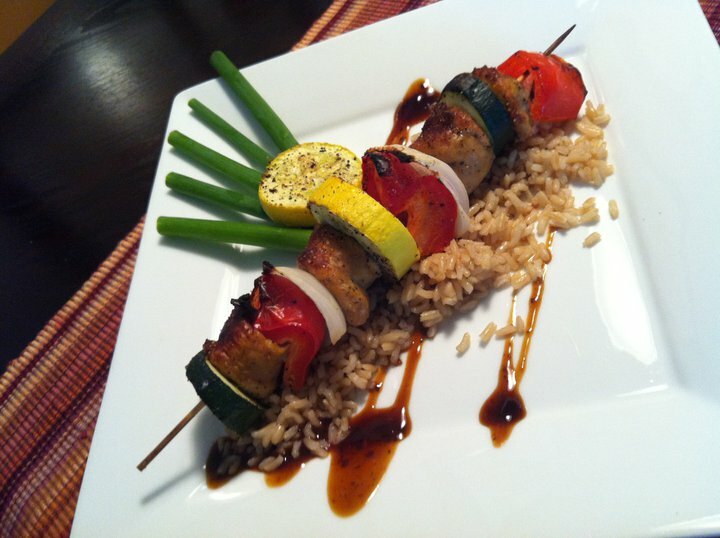 Fresh sun-dried tomato and basil chicken sausage, skewered with local squash, Vadelia onion and red peppers on a bed of brown rice and spicy Thai sauce. Health be damned… and the rest of us too! I was reading the Face Book posts of some of my “health-conscious” friends this morning before work. I’d say approximately 25% of my list of Face Book friends are what most would consider “healthy.” Maybe I should rephrase that, because in my opinion anyone who has a heartbeat and can breathe is pretty much healthy, however, I DO have several “friends” who are truly health-conscious. I was saved by Jesus. 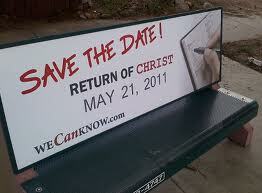 Apparently, this Saturday May 21st, we will have the second coming of Christ. From the snippets and sound-bytes I’ve been hearing we will have some sort of earthquake this weekend (God… don’t let me die at work under a cheap sofa) and only GOOD Christians will be “selected” to join Jesus in life everlasting. Then from what I understand, the FINAL earth-destroying quake will happen on October 21st causing the world to be consumed by fire and those originally chosen Christians will float like the angels they are into Heaven. Obviously, I’ve paraphrased, but you get the point (as in pitchfork, I’m guessin’). All that being said, I’m going to sit here and open another bag of marshmallow Circus Peanuts and raise my glass of non diet Pepsi to my health-conscious Face Book Friends! You all know who you are. After this Saturday it will not matter who is healthy and who is not! As I stare in awe of these images and videos from Japan showing devastation from the 8.9 earthquake and subsequent tsunami, I can’t help but feel emotionally overwhelmed. I am struck by the irony of the recorded security camera shots, as the Japanese people on the inside of buildings are physically shaking while papers and dust fly and signage, glass and books fall from walls. The looks of confusion and looking upward toward the tumbling debris remind me of those horror movies I used to watch as a kid where Godzilla was stomping around and breathing fire while wreaking havoc over Tokyo. Those movies were fun and campy. Today’s earthquake videos are not. I am also emotionally paralyzed as I watch the footage of the tsunami being played over and over again from different locations. I am floored as I watch a manned ship being tossed about like a toy in a bathtub, and a wave of debris and mud literally swallowing an entire neighborhood within seconds as entire cities burn to the ground. Viewing these graphic images from a distance on my TV with these heightened camera angles (I assume, some from helicopters) recording this disaster, I cannot help feeling removed and isolated. Where are the people? I don’t see people in these videos. It’s not like when I watched the burning twin towers on THAT horrendous day back in 2001 when I could SEE hapless individuals hanging out of smoke-filled windows behind the bluest of skies. I watched in fascination, then horror as they waved and pleaded for assistance that was never to come. I watched as each made his or her choice to briefly fly in the freshest of air before twisting to the concrete below. Again, I was helpless. In Japan today, the death toll continues to rise. Statistics of the dead. So clinical. So uninvolved. So newsworthy. Too overwhelming. We don’t see the individual fear in the eyes of those on the ground being swept out of the way in a sea of death and destruction, watching as their families and friends are being torn apart by the forces of sticks, trees, cars, homes and mud as they grasp desperately at hands and legs with no time to say goodbye. We, in the States, are left with our nightmarishly vivid imaginations. So as I sit HERE, watching the quivering ground of Japan from the air as if I’m God; I can only pray. 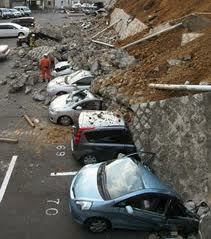 I know that Japan will survive this disaster. I know that WE will survive this disaster. Humanity always manages to find ways to move forward as individuals, as communities and as a life force. Until then, may we find ways to cope, ways to support and ways to heal the people of Japan.